This Sunday (June 6) Temple Ahavat Shalom in Northridge (California) is having its annual benefit gala, which includes a fundraiser auction. 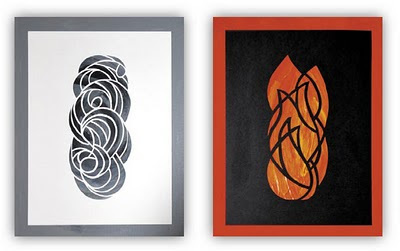 Two of my papercuts will be available for bidding: "Pillar of Cloud" and "Pillar of Fire." They are both works in paper and acrylic on canvas, measuring 11" x 14". They are mounted above the canvas, so the interplay between form and shadow is more pronounced, and they've been professionally framed in deep frames. More information on the gala is available on the TAS website here.